Traditional approach for surgical management of mature pancreatic pseudocysts is by internal drainage by cystgastrostomy or cystjejunostomy via open or laparoscopic approaches. Endoscopic drainage procedures have been described; however, they require multiple interventions and are sometimes not definitive. 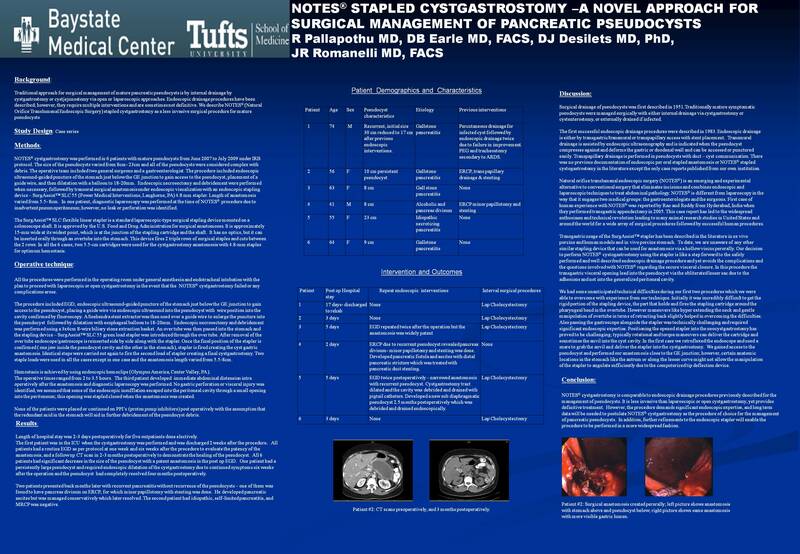 We describe NOTES® (Natural Orifice Translumenal Endoscopic Surgery) stapled cystgastrostomy as a less invasive surgical procedure for mature pseudocysts. Length of hospital stay was 2-3 days postoperatively for five outpatients done electively. 2 weeks after the procedure. All patients had a routine EGD as per protocol at one week and six weeks after the procedure to evaluate the patency of the anastomosis, and a follow up CT scan in 2-3 months postoperatively to demonstrate the healing of the pseudocyst. All 6 patients had significant decrease in the size of the pseudocyst with a patent anastomosis in the post op EGD. One patient had a persistently large pseudocyst and required endoscopic dilatation of the cystgastrostomy due to continued symptoms six weeks after the operation. Two patients presented back months later with recurrent pancreatitis without recurrence of the pseudocysts – one of them was found to have pancreas divisum on ERCP, for which minor papillotomy with stenting was done. He developed pancreatic ascites but was managed conservatively. The second patient had idiopathic, self-limited pancreatitis, and MRCP was negative. NOTES cystgastrostomy is comparable to endoscopic drainage procedures previously described for the management of pseudocysts. It is less invasive than laparoscopic or open cystgastrostomy, yet provides definitive treatment. However, the procedure demands significant endoscopic expertise, and long term data will be needed to postulate NOTES cystgastrostomy as the procedure of choice for the management of pancreatic pseudocysts. In addition, further refinements to the endoscopic stapler will enable the procedure to be performed in a more widespread fashion.